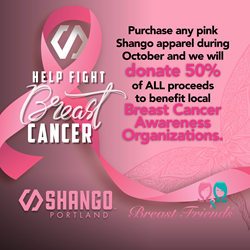 Shango Premium Cannabis dispensaries and Breast Friends, a breast cancer support group based in Tigard, are again teaming up for the annual October sale of pink merchandise for cancer patients. Shango will be selling pink-accented shirts, stickers, pins and vape batteries and chargers to raise funds to give funny hats to women who suffer hair loss during treatment. After being spurned last year by three national breast cancer charities, the owners of Shango dispensaries turned to Breast Friends, a smaller national group based in Tigard. The results of the partnership with Shango thus far have been positive for Olson’s group, which took a chance on the stigma that often assails cannabis users. “Breast cancer doesn’t discriminate and neither do we,” is the mantra Olson holds. After the media released details of the partnership in 2017, another donor stepped forward, citing the article as inspiration. Battling cancer for the fourth time, Olson decided to give CBD lotion, derived from cannabis extractions, a try. Olson said the money donated last year purchased about a thousand hats. Breast Friends gives out more than 700 hats a year to patients. See http://www.breastfriends.org for more info. “Cannabis is a realistic approach to side effects of breast cancer and people are becoming more acceptant of that,” Olson said. Shango owners will present the check from pink merchandise sales at the Breast Friends annual open house on Nov. 8, sponsored by Olive Garden. Last year, the group was celebrating receiving funds of $50,000 from October events. The money will go toward free support services. Breast Friends believes that no woman should go through the cancer experience alone. Unfortunately, it happens. Women with friends and family nearby often fail to receive the kind of emotional, spiritual or physical support they need. Breast Friends programs are designed to ensure proper support is given and received. Every woman in America will be touched by breast cancer or other women’s cancers in her lifetime. One in eight women will be diagnosed, and the other seven will know her. The goal is to reach the seven in order to help the one. Shango also took part in the Breast Friends golf outing last July. Shango offers private sessions for anyone fighting cancer. “If someone fighting cancer needs special attention, we will give it to them,” Dubocq said. Breast Friends also has taken a pro approach to cannabis during their weekly internet radio show. Olson said the show draws 10,000 to 15,000 on-demand listeners through their live podcast show on VoiceAmerica.com health and wellness channel that airs live at 9 a.m. Wednesdays and is archived by searching for Breast Friends on the site. Breast Friends’ governing body is made up of a board including the two co-founders, executive officers and board members who also oversee the Oregon affiliate. Breast Friends was founded in Oregon in 2000. The group has helped thousands of patients and their families. The organization has a prosthesis, bra and wig closet and offers products free to women who have little or no funds available to purchase them. The group’s Facebook page is Breast Friends of Oregon. Shango is a premium cannabis brand licensed to a full range of award-winning cannabis products, including flower, extracts and cannabis-infused edibles, produced by select cultivators and processors in Oregon, Nevada, California and Washington. The Shango brand also is licensed to tthree full-service recreational and medical cannabis dispensaries in Oregon, California and Nevada. A recognized leader in the cannabis marketplace and industry, Shango sets the highest standards for product quality and consistency, and business conduct. Shango is committed to cannabis education and is a fierce advocate of the safe and responsible use of cannabis products. Shango Premium Cannabis stores are located at Shango Harold, 8056 SE Harold St., (Located at 82nd and Foster), Portland, and Shango Win Sivers, 6033 NE Win Sivers Drive, (by the airport), Portland. Next articleFirst Annual “Oneday Against Hate” Sparks Widespread Conversations of Understanding Online and in Workplaces, Schools, Houses of Worship Across the U.S.